I took some time to do the IT course “Grow with Google – IT Support Specialist Certificate”. It wasn’t as much to learn things as to prove to myself that I knew a thing or two about IT. The course as I expected was easy in many areas, but it did start proving difficult because it covers such a broad range of areas. There were also topics discussed like CIDR format which I was intrigued by only to find I already knew exactly what it was, I just didn’t realize it had a special name. I learned terminology and some of the background inter-workings of things that I didn’t previously know so it was definitely nice to have some supplemental training on topics I’ve already been exposed to. I’d recommend it for most people, especially those that have some beginning knowledge in IT already. Some of the first courses that took me next to no time to complete like the system administration stuff, I felt would be hard for someone that had never been involved with Linux or Windows. However, I went straight to the labs and skipped over material, so I can’t make an official opinion of it. The -u argument instead of -l will set the account as unlocked. Curious for more details on who has attempted logon? Keep in mind, aside from locking a user out, it is equally important to make sure you properly lock down your firewall to expose ports like 22 only to specific IPs. Don’t leave yourself exposed to the world. Today I had an experience that is not too far off from experiences I’ve seen and experienced in the past, though, not directly caused by me. As a typical (non-ma’ pa’) business setup, it is perfectly normal to have 2 or more domain controllers with DNS on a Windows based network. You ALWAYS want to point your DNS settings in DHCP to your domain controllers (Note the s in that last word). The experience was of maintenance on a server that caused a partial network ‘outage’ as it wasn’t able to find a second DNS server when maintenance was started on the Domain Controller 2. The problem came when, out of our 4 domain controllers, the one I happened to be doing maintenance on was the only one in use by the network…… (and mind you this is a 2008 domain controller, not our Server 2016 domain controller, yes that is an 8 year old server). This is why redundancy is SO important. You should ALWAYS specify 2 DNS servers if you are in charge of a network. And you should be very conscious of what servers could be decommissioned in the future as well. You should feel a nasty feeling in your gut until you have a second one in there. You should always have more than 1 uplink to your VMWare hosts preferably on a secondary network card. Hardware failure isn’t super common these days, but it does happen. If your company is larger, you want to be sure you have HA (high availability) running on your core network equipment. You want to pay for a second internet provider. Whether it is a network, a virtual machine, or something else that is business critical, PLEASE make sure you have redundancy built in to prevent issues like this. And if you are the one performing maintenance, you do always want to go over a mental checklist of what a server is performing for the business. If you are also controlling the network, you should NEVER have holes as giant as specifying only 1 DNS server in your network. Please note, I was not responsible for the network in this particular scenario. When it comes to a system image vs running scripts to set up a new computer and the necessary software, I find there is a healthy balance. On one hand it makes much more sense to create an image so out of the box its ready to go, but on the flip side, you have to update the drivers, the software, etc. In my experience, it makes sense to have a balance of both. Install items that update frequently via script so you aren’t plagued with updating your image 5 times a month or manually updating the software on deployment, or just install it via script. Usually installers these days pull the latest version anyhow and its not like the older days where it would be a static version that you downloaded. Take Ninite for example. I’d prefer running it once to having Chrome, Firefox, and whatever other small apps the company required be out of date 2 weeks after I created the image. Granted, the licensing can be a bit spendy for some companies. Some might argue…. why not just run Ninite again to update them. True… easy enough, but why? I like things “fresh”. “Clean”. Call me the tree hugger version of the IT squad I guess. Regardless, there’s never a one-option solution in IT. And that is one of the things that makes it so great! Missing users? You might not be losing your mind! ADSI Edit contains a variable to hide the user account from the non-advanced view in Active Directory Users and Computers. There are certain use cases for this feature but for the most part it shouldn’t be used often. See the image for the setting in ADSI Edit. In Active Directory users and computers, right click Queries> New. Give it a name, click “define query”. Stay on the “Users” tab. Select “Is not” and type an invalid name like testtesttest. Click ok, ok. It should return a result with all users whose name is <<not>> testtesttest. Select all, right click> Properties. Go to Account tab> check “UPN Suffix” and change it to the appropriate suffix. That’s it! There are PowerShell methods to do this too but when handling hundreds of user accounts, you have to be absolutely careful in PowerShell. There are solutions online that work fine that I am not going to post here. This is purely for the GUI. Good luck! quantity. These are established as Reorder Points in the Items Module. An alert may be sent to a user via SMS or Email, as specified in the Reorder Points Tab of each Item. Reorder Points allow you to set min, max, and alert levels for each of your parent locations. hand for that location reaches the alert levels. To create a stock alert, go to the Items Module and select the desired item from the list. icon in the upper right hand corner. Parent Location – The head location for this item. Min – The minimum inventory quantity that should be in stock for this item. Max – The maximum inventory quantity that should be in stock for this item. email associated with this item. The Item Reorder Points tab will show a list of all Parent Locations associated with this item. Each Parent Location can have their own min, max, and alert levels. What do the Min and Max mean? when a PO is to be created. Reorder Point Levels (Alert/min/max levels) may be imported in mass through a CSV file. 2. All Imports provide you with the option to download a sample CSV file. your own file and add each of the headers needed yourself. 3. Once the CSV file has been properly formatted, repeat Step 1 above. This time, select Choose File. are appropriately matched, click Next. choose the Import Data option in the lower right hand corner. include the spreadsheet or details on what you need help with when you contact us. access only to Purchasing or Sales. Note: Only those with admins rights are able to create and grant User permissions. the Name or Description columns. History – This icon shows a history of the Group, including any Users who made changes. New Permissions Group box will be displayed. Permissions Tab to view and grant access to all of the different permissions for this group. Checking the box next to each module will grant permission to all of the features within that module. a module may be checked. Save to save all changes. Yes to confirm the group’s deletion. The following questions are those most asked to our Sales and Support team! Before reaching out to our staff, we recommend browsing these questions for some insight. How can I schedule a Boxstorm Training? Existing customers: Email support@boxstorm.com with a list of questions and a preferred date and time. On the login screen click the “Forgot Password” link to receive an email that helps reset your password. If an email does not arrive soon, please check any spam and junkmail folders. How do I import and export? Almost every module has the capability to import/export data in batch files. Go to the desired module and click the 3 vertical dots located in the upper right hand corner of the screen. We recommend downloading a sample CSV file to first see the correct format that a file needs to be in. Once the CSV file is prepared correctly, it may be imported by using the Import | Choose File option. Please see Import Items using a CSV file for additional step by step instructions. Does the Auto Create create a PO per item or per vendor? The Auto Create will create a PO per vendor. How do reorder points work? What are they for? Reorder points set a minimum and maximum threshold for when an item should be reordered. If setup, Boxstorm will automatically create Purchase Orders through the Auto Order feature when these points are crossed. Low stock alerts may also be sent via email or text. Additional information may be found at: Create an Item (reorder points) and Purchase Orders. How do I undelete an item? 1. Go to the Items Module and click the Filter Items option in the top left corner. 2. 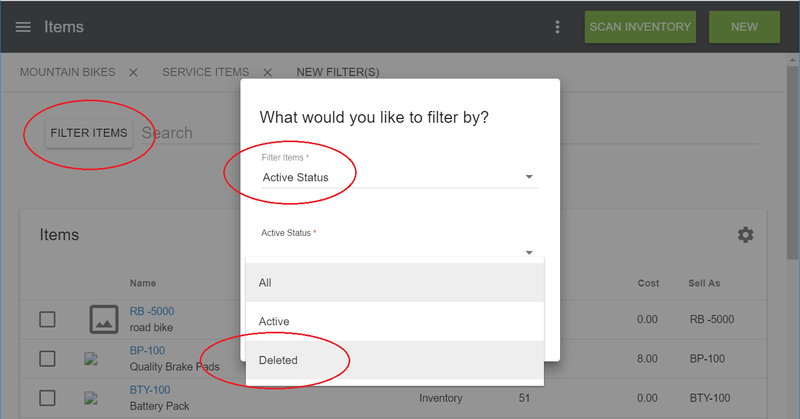 Filter Items by Active Status | Deleted. Click Apply. 3. 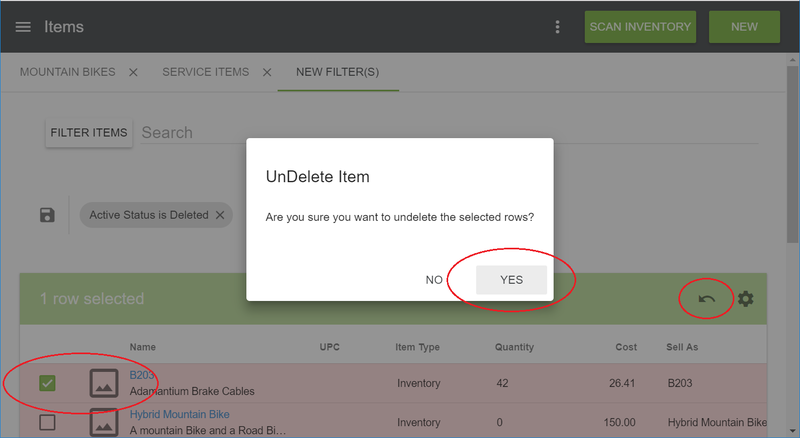 Highlight the checkbox of the item to be undeleted and click the “Undelete Selected Rows” icon. Click Yes to confirm the decision. How do I add or remove inventory? In the Items Module focus on the line item of interest and choose the Inventory icon located on the far right side. A list of inventory items by location are found in the pop up box. Select the location to modify and choose to Add, Remove, Cycle, adjust Cost, or Move inventory. For additional detailed instructions please see Adjusting Inventory for an Item. How are the Boxstorm web and mobile app different? Unlike the web app, the iOS and Android apps cannot create sales orders or purchase orders. The current purpose of the mobile app is to look up items, see quantities, and edit items. Additional features (creating SOs and POs) for the mobile app will be included at a future date. Can Boxstorm handle 2D barcodes? Does Auto Create make a PO per item or per vendor?